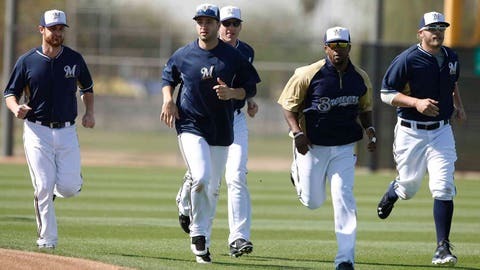 Milwaukee left fielder Ryan Braun (second from left) and second baseman Rickie Weeks (second from right) are two veterans who could be expected to lead the Brewers this season. Offense: Derailed by injuries and suspension to the middle of their lineup, the Brewers still found a way to be an average offensive team in 2013. Milwaukee is counting on the return of Ryan Braun and a healthy Aramis Ramirez to vault its offense back among the best in the National League. Finding a leadoff hitter to replace Aoki will be key. Jean Segura, Carlos Gomez and Jonathan Lucroy join Braun and Ramirez to give the Brewers five potentially dangerous hitters. Reynolds could thrive hitting at Miller Park. He’s competing with Juan Francisco and Overbay at first base. Rotation: The Brewers went out and spent $50 million over four years for Garza, hoping the 30-year-old can team up with Kyle Lohse and Yovani Gallardo to give Milwaukee a top three capable of contending. Wily Peralta was inconsistent during his rookie season, but showed flashes of being a top-of-the-rotation pitcher. Marco Estrada will likely fill out the rotation. When healthy, Estrada has proven to be a solid back-end option. Milwaukee also has depth in the minor leagues, as Tyler Thornburg, Jimmy Nelson, Johnny Hellweg, Hiram Burgos and Mike Fiers all have big-league experience. Thornburg had a 1.47 ERA in seven starts in 2013. Bullpen: Milwaukee drastically improved in this area last season, going from a league-worst 4.66 ERA in 2012 to the fifth-best ERA at 3.19. Jim Henderson will begin the season as the team’s closer after saving 28 games in 2013. Brandon Kintzler and Rodriguez will team up to cover the seventh and eighth innings, while Tom Gorzelanny is a versatile lefty. Acquired in the Aoki trade, Smith will give Roenicke another left-handed option. The rest of Milwaukee’s bullpen will be filled out with young, inexperienced arms who got their feet wet last year. Player to watch: Khris Davis. The Brewers are hoping the powerful young outfielder can step into the lineup in left field after trading Aoki to Kansas City and shifting Braun to right field. Davis is in there for his bat and isn’t the most polished defender, but Roenicke and the Brewers feel the 26-year-old could hit 25 or more home runs in a full season. Why they will win: If the Brewers can stay healthy, something they didn’t do last season, Milwaukee could be a sneaky contender in the NL. The offense should be potent again if Braun and Ramirez return to form, while Gomez and Segura need to produce like they did last season. The rotation has three solid veterans at the top and plenty of young depth to fill out the back end. The Brewers have a chance to make a playoff run if they can get off to a good start. Why they will lose: The NL Central sent three teams to the playoffs last season and none of them seem poised to take a major step back in 2014. Milwaukee may not have enough firepower to contend with St. Louis, Pittsburgh and Cincinnati. Ramirez is 35 years old and coming off knee troubles, while Braun is returning under heavy scrutiny across the game, and Garza comes in with a bit of medical record. The Brewers won’t be a factor if injuries strike again, as the margin for error is slim. Jon Paul Morosi’s outlook: However incomplete his admission of PED use may have been, Braun is back in the Brewersâ lineup to begin the season. He should adapt to his new role in right field, but questions remain about how productive and durable he will be at age 30 â presumably without chemical enhancement. The health of third baseman Ramirez, who was limited to 92 games last year, is nearly as important to the Brewersâ season as the manner in which Braun responds to the scrutiny heâs about to face. The pitching staff should be better if Garza, Gallardo and Lohse perform up to their track records. The Brewers canât afford a repeat of last yearâs 4.20 rotation ERA.